"A larage mural on the side of 1211 N LaSalle creates the illusion that the structure contains Chicago School bay windows and a cornice with a circular window. 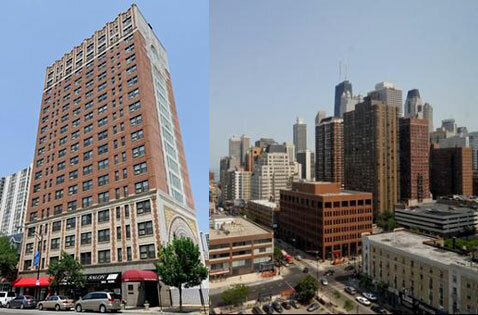 Convenient location near bus, train and large Jewel-Osco grocery store." 1211 N LaSalle is vintage condo building in the Gold Coast near the corner of Division and LaSalle. The building has 68 units and just 4 units per floor. 1211 N LaSalle features a rooftop deck with panoramic city views. In addition to accessibility to the Gold Coast, the location of 1211 N LaSalle also gives residents easy access to Wells Street in Old Town with lots of restaurants, shops and more.